Smalls and I have had a lot of fun watching "Ben 10" on Netflix recently so I had to make something yummy to go along with it! Enter my first real attempt at decorative sugar cookies. The first attempt was sad/laughable (because I decorated them with royal/cookie icing and ended up with a black tongue) but I brainstormed some more and each attempt afterwards got progressively better (5 batches total!). The final product does NOT turn your mouth colors, but it does turn it into a smile 'cause it tastes so good! 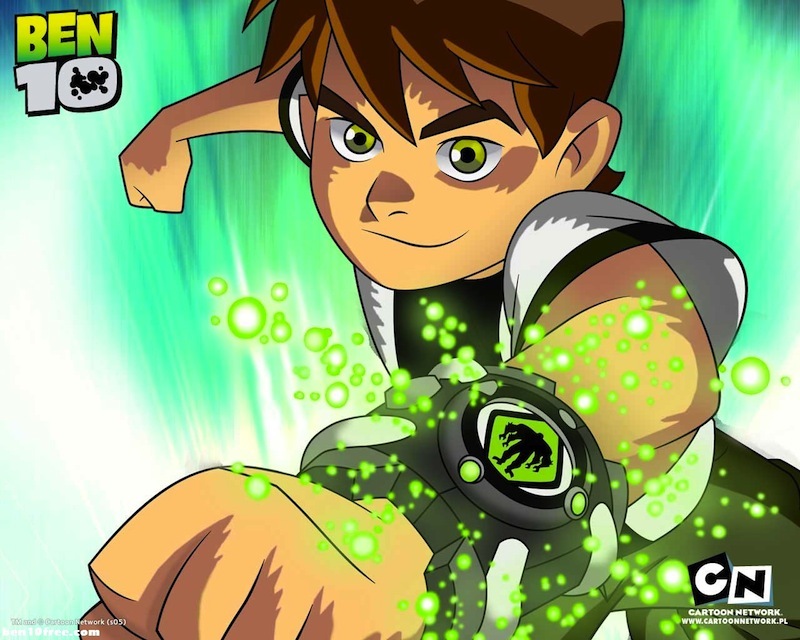 "Ben 10" is an awesome science fiction cartoon on Cartoon Network that is currently in its fourth series (yes, series). I haven't seen the most recent incarnation but the original series simply called "Ben 10", the second series "Ben 10: Alien Force", and the third series "Ben 10: Ultimate Alien" are all really good with a ton of action, a lot of humorous writing and dialogue, and great characters. 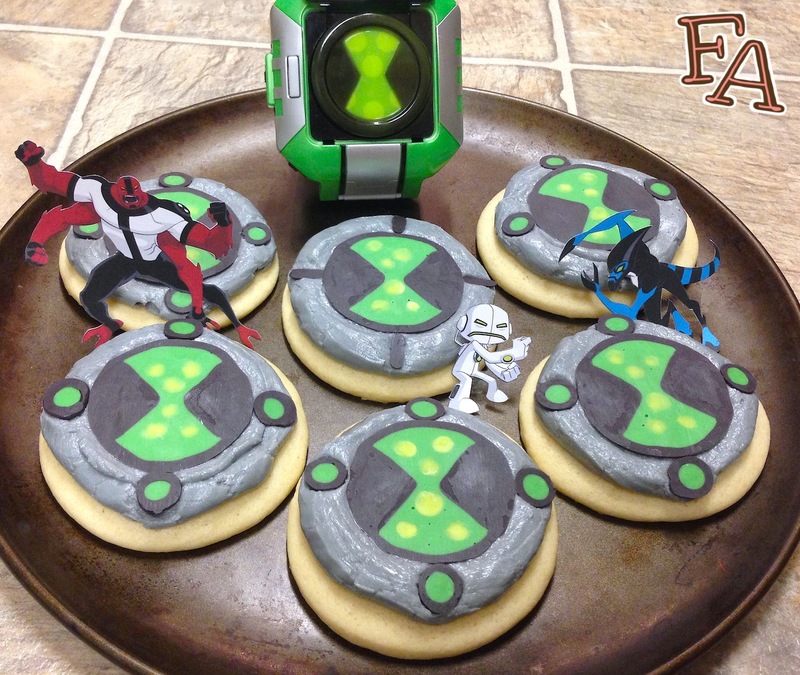 The candy melt image shown on the cookies is the omnitrix symbol found on the omnitrix "watch" that Ben Tennyson wears on his wrist that lets him change into ten different aliens (the aliens change throughout the series) as well as the symbol of the Plumbers, the Green Lantern-type of intergalactic peace keepers/police. 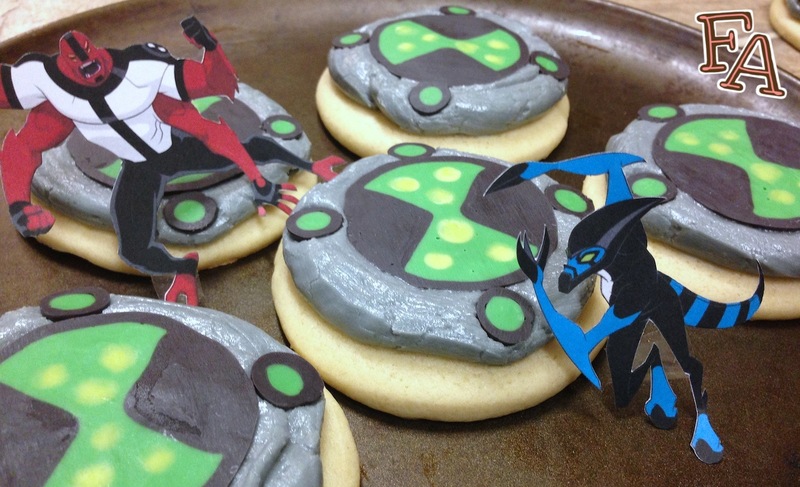 The cookies are a representation of the omnitrix in the original series and the two following, with a little bit of the new one thrown in. 1. Print out the omnitrix symbol sheet and tape it to your counter. Tape a large sheet of parchment paper over top of the print out (or better yet, use small magnets). Melt about half the bag of black candy melts + a small spoonful of shortening or Tbsp. or oil in a small bowl in your microwave at 30 intervals, stirring in between heatings, until it's all melted. Pour it into a squeeze bottle or decorating bag & trace the outlines of the omnitrix symbols on the parchment paper. Allow to harden. 2. Melt a very small amount of the vibrant green candy melts + shortening or oil in a small dish & use it to paint small dots in the empty hourglass shape of the omnitrix symbols. Next, combining green candy melts with some of the vibrant green candy melts + shortening or oil, heat them until melted in a small bowl & pour into another squeeze bottle or decorating bag. Carefully fill in the hourglass part of the omnitrix symbols, covering up the light green dots you just made. 3. 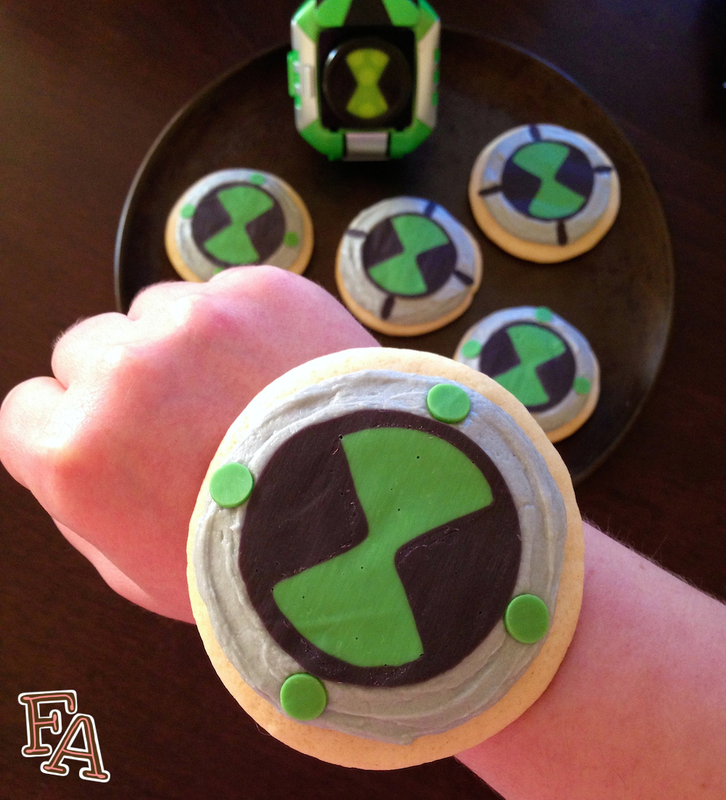 For the outer decorations of the omnitrix "watches": (Original "Ben 10" series) Use the melted green (reheat if needed) to squeeze out small green circles/dots (4 for each cookie). Let them sit for a few minutes to form up & then ring each one with black. 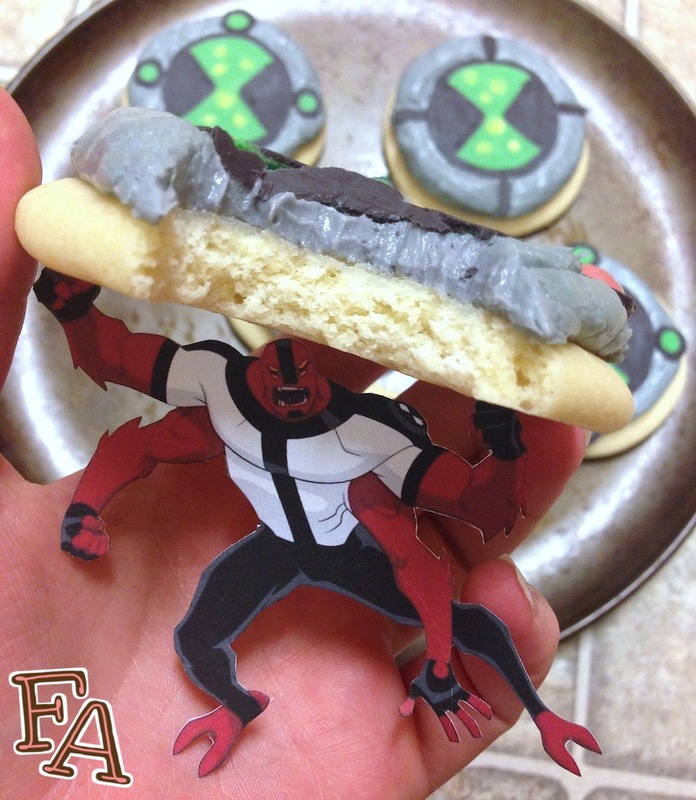 ("Ben 10: Alien Force/Ultimate Alien") Use the melted black to create several short black lines (4 for each cookie). Let all of the candies harden completely before using (about 30 min. to an hour). 4. Using a sturdy plastic bag or decorating bag carefully squeeze the grey buttercream frosting in circles on top of the cooled sugar cookies, pressing the bag down slightly so that the frosting spreads out and isn't too puffy. Carefully separate the omnitrix candies from the parchment paper by peeling the paper away from underneath (it's a bit confusing to explain but it works better than using a spatula). Place the candies, bottom side up, on top of the frosted cookies & gently press them down with small rocking motions, pressing on all sides of the candy to make it even. This will cause the frosting to press out a little to give more room for the outer decorations. (Be careful not to melt the candies with the heat from your fingers! Run your fingers under cold water & then dry them completely to cool your fingers.) Next, peel the side decorations off the parchment paper & place them in the appropriate places around the omnitrix symbols (see images in this post). These cookies look so adorable. I want to try to bake them. I wish I had kids so that they could decorate with me. But even without them, I think it'll be so fun to bake and decorate these. I never thought cookie decorating could get so creative. I love the melted effect. Thanks for sharing your ideas.